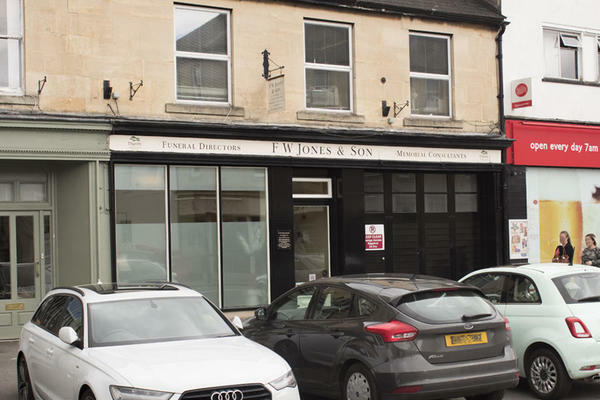 We are F W Jones & Son Funeral Directors in Chippenham, and are here to help make a difficult time a little easier for you and your family. We love the community we serve and have a wealth of local knowledge, as well as many decades of funeral expertise passed down over the generations. Our founder, Frederick William Jones, was born in 1904 in the village of Studley. He began working life as a cabinetmaker, and loved football as a keen supporter of Chippenham Town FC. His skill set equipped him to do a funeral undertaking apprenticeship at E Wootten & Son, before he decided to start his own caring and professional funeral services. It was not long before he became a popular and valued part of the community. Three generations later, the Jones family are still part of our funeral directors today. We have a warm and welcoming funeral home with large windows and beautiful paintings of 'old Chippenham'. We have an impeccable Coleman Milne Mercedes fleet, which you can use for your loved one's funeral service if you wish. We have strong ties with the community we love; we are located close to West Wiltshire Crematorium, St. Paul's Church and St. Andrew's Church, where we hold a Christmas memorial service every year with around 300 people attending in memory of their loved ones. We are here for you, no matter what, and you can call us 24 hours a day. Please get in touch as soon as you need advice or assistance. Call us today on 01249 652525 to talk through your personal requirements. At F W Jones & Son Funeral Directors, we understand how special life is with those that you love. For us, every funeral is unique and personal. We have a service to fulfil every wish, with every detail carried out with the same uncompromising quality of care. From a traditional service, to a colourful woodland burial, your options are limitless with our Full Service Funeral. If you have a little more flexibility when it comes to arrangements, then we can provide a Simple Funeral for a lower cost. There is parking on the main road for up to one hour. Our staff are available 24 hours a day on 01249 652525 if you require our services outside of these hours. All the staff were friendly and empathetic. There was no rush in making decisions and we were guided through the whole process in a caring manner. My family have used Jones as an undertaker for previous funerals over the years and although it is now under “ Dignity “ it still felt the same. F W JONES ARE TRUE PROFESSIONALS AND NOTHING IS TOO MUCH TROUBLE. The service offered was very respectful and dealt with sensitively. They found a brilliant Celebrant for us and dealt with the caterers and printers. We didn’t really have to do very much at all. Thank you for taking the time to complete the online review. I am glad that we were able to provide you with the the care and support needed and that all of the arrangements were carried out to your satisfaction. From initial consultation and through out the whole process leading up to and during my mothers funeral F.W.Jones were helpful, considerate and willing to do things how we wanted them. Excellent. F W Jones & Son provided an excellent service and helped make a difficult situation for my family all the more bearable with their caring attitude and efficiency. Mum's funeral is exactly what she would have wanted. All the team we dealt with at F W Jones were amazing - Nina, Martin,Barry and Abi. I would have no hesitation in recommending. A big thank you from Marian's family. I want to thank you for your 5* rating and comments. We are happy to hear you were treated with respect and compassion and that your wishes were fulfilled. Thank you once again for your review. All the staff we met were very kind and helpful. The actual cremation service was good. I could not have wished for better. Five stars. Thank you for taking the time to send your online review to us you. I am pleased that all of the arrangements were carried out to your satisfaction and that you were so well looked after by our team. Everything was done as requested, nothing was too much trouble. Thank-you to the whole team. My mother's funeral was handled in a professional way from start to finish. I had one meeting at F w Jones & Son offices the rest of the arrangements were carried out by telephone as all the family live at least 150 miles away from Chippenham. All requests were carried out to my satisfaction. The day of the funeral went very smoothly. Thank you for taking the time to share your thoughts with us. I am pleased that our team provided the highest level of care and guidance to you and your family. One again we have found Mr Jones to give us a sympathetic and truly "undertaking" service at a time when one needs all the help one can get. His is very sympathetic with our sincerely held Christian beliefs, which means that awkward conversations are avoided. Mr Jones made it a very easy journey what was a very sad and emotional time in my family and my life are enormously greatful for his kindness and help during this time.The funeral was carried out with much love and respect. Thank you for the kind comments posted on your online review. I am pleased that we were able to look after you and your family at this difficult time and that we provided the care and support needed. A very respectful, caring and supportive service. Nothing was to be to much trouble, anything I asked was answered. first class service. The service given was first class, nothing was too much trouble,every detail was delivered in a friendly manner but very efficient.Abbie was very helpful, friendly,nothing was too much trouble. Michael was very professional but very friendly. Thank you for taking the time to send your online review to us. I am glad that you were so well looked after by our team and that we were able to provide you with the care and support needed at this time. My family and I were very pleased with the service Fw Jones gave us while arranging my Father's funeral they were very kind and thoughtful and Adam made the whole process go faultlessly and the funeral went off just as we hoped.